With a wine cellar housing over 350 bottles, Kviknes Hotel offers wine tastings for groups up to 20 people. Balestrand is a marvellous starting point for mountain walks. From the village center footpaths through the woods and fields lead up into the mountains offering magnificent views. Just 10 kilometers from the center of Balestrand lies the workshop of reknown enamel artists in Solveig and Rolf Haukaas. Join a complimentary tour to explore the workshop and jewelry store. Centrally located in Balestrand and displays regional fish of the local fjord fauna, the Sognefjord Aquarium is an exciting visit for everyone in the family. Presentations and lectures discussing the history of wildlife on the fjord are available in the summertime. 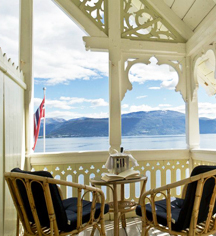 Discover the charming town of Balestrand with or without a guide. Maps with passes and suggested routes are available at the hotel. Exciting and comfortable adventures on safari boats offer the best experience to indulge in the beautiful west Norwegian fjords and its rich wildlife at close range. Sites include the world heritage listed Aurlandsfjord and the Nærøyfjord, representing one of the most extreme and stunning fjordlandscapes in the world. Wildlife - like seals, porpoises and eagles are frequently encountered. Guides will help point out nature, local history, culture and the wildlife; and will share stories, tales and legends, from various places of interest. 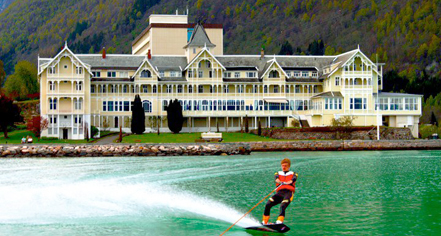 Sunnfjord Golf Club's magnificent course lies in beautiful and family-friendly surroundings by the well known trout and rafting river Jølstra. Sunnfjord Golf Club has a demanding par 69, 9-hole course through the woods, as well as a fine, large driving range and putting green. A visit to The Heiberg Collections - Sogn Folk Museum at Kaupanger, just beyond Sogndal, is both educational and interesting. Discover the history of old Sogn by visiting old restored homes and buildings. A trip to the museum may be combined with a visit to the Boat Museum at Kaupanger, featuring a collection of boats which were used on the fjord in former times. As the largest glacier on the European mainland, the breathtaking Jostedal Glacier National Park is a striking blue stretch of breathaking ice flowing towards fertile green valleys. Experienced glacier guides are available for tours of every physical level to discover this natural wonder.